Come join us for a time-honored tradition at DKE: Pool night at Snooker Centrum on the 14th of September! 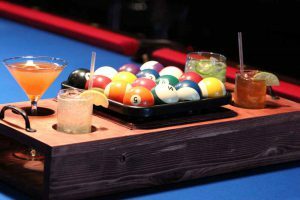 A casual evening of billiards and booze (and sports on TV) at the biggest and best snooker hall in Maastricht, where you can scratch your way to embarrassing losses and laugh it off with friends, or pull off impressive pool tricks for your Instagram. Entry is €5 and gets you unlimited access to the tables all evening. Drinks are your own responsibility, but the Snooker Centrum has very cheap drinks compared to the pubs in the city center. No registration required, just show up at the venue and find the large group!